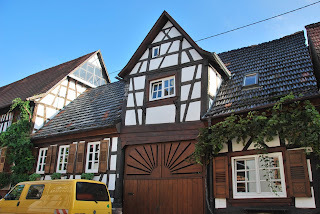 This week’s writing prompt, the old homestead, took me back to my visit to Steinweiler, Germany in September of 2013. Steinweiler is a small (current population around 2,000) town in the Rhineland-Palatinate region. The area was first populated in 968, though it was not called Steinweiler until 1585. It was there that I saw the home of my 6th great-grandparents, Johann Ulrich Schwein and Margarethe (Erbauer) Schwein. Ulrich, as he was known, was most likely born in Steinweiler though I have been unable to find information about his parents or date of birth. I do know, however, that in 1717 he married Margarethe Erbauer in Steinweiler. The couple built their house in Steinweiler of half timber construction, which was common in both rural and town locations in Germany at that time. The frame of the building was made of timber, usually oak as it was plentiful. Triangular bracing was added to give additional support. The space between the timbers was filled with a mixture of branches, clay and straw. Plaster was then layered over that. The timber often remained visible both inside and outside the building. 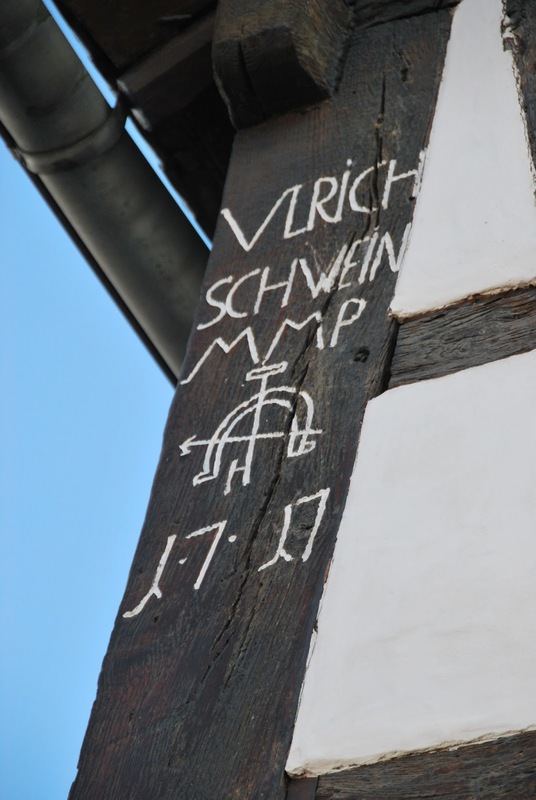 As was popular, Ulrich had his name and the year his household was established etched into the facade of the house. The symbol between his name and the date let people know that Ulrich was a blacksmith. As Schwein indicated the occupational name for a swineherd, the family most likely had pigs as well. The construction of the house would indicate that animals were kept there as well, as you can see from the photo in the bottom right. While I was photographing the outside of the house, the owner arrived home from work. My German guide explained to him why I was taking pictures, and he invited us to see the inside. It was beyond thrilling to cross the very threshold that my ancestors had crossed hundreds of years ago. I still get goosebumps when I think about it.